Be the driver of innovation in Science & Technology. 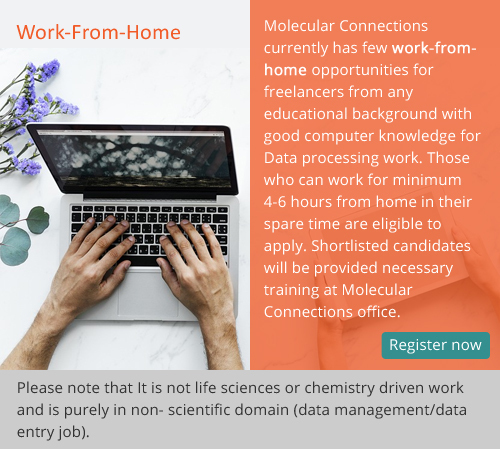 Be a part of Molecular Connections community. We at Molecular Connections, value each and every employee. Our employees are the engine of our growth. Through the years, Molecular Connections has emerged as the employer of choice for individuals seeking to work on challenges which can make a difference to the larger scientific community. We are growing continuously, at present with 1700+ employees working at multiple development and delivery centers located across Bangalore and Chennai. Molecular Connections provides a unique interdisciplinary and international work environment. Our teams of scientists, technologies, and business experts, include Post Graduates (MS/M. Sc. ), Doctorates (PhD’s), Engineers and MBA’s from reputed institutions in India, Europe and US. Find a job that matches your skills. Molecular Connections is an equal opportunity employer and prohibits all kinds of discriminatory practices and promotes talent solely based on merit right from selection process and offers recognition and growth to each individual based on his/her performance. The Company offers a work environment in which all individuals are treated with due respect and dignity. At work, professionals from varied cultures and backgrounds collaborate and compete on an even keel and work towards the shared vision of the Company. What binds us together is the shared commitment to corporate goals, team work, individual learning and growth.